Government slush funds give us the means to build things we don’t really value, won’t fully utilize and ultimately lack the resources to maintain. Unfortunately, with the top/down tax structure the way it is today, local governments often have few choices but to go down this less-than-honest path. If we want a nation of Strong Towns, we need to accept a world in which we only build the things we are willing to pay for. Greetings to all of you from Wisconsin that heard us for the first time last week. Please consider becoming a member of Strong Towns, supporting our work and connecting to us so we can continue to support you and help your cities become strong towns. There was a lot of energy in that room. Thank you for that. Let’s keep the momentum going. Last week, the city council in one of my joint hometowns – this time suburban Baxter, MN – was presented a plan to add a monthly franchise fee to gas and electric bills, a charge that would be passed on to utility users. Residential property owners with electric and gas would pay an additional $60 per year for their service. Commercial users will be charged up to $2,244 per year. What is this charge for? Is the city experiencing extraordinary costs in administering their franchising program? Are there hidden costs in relocating utilities that the local government is trying to recoup? Is there an upgrade to the gas/electric system that the city is trying to fund? Tuesday, the Baxter City Council listened to options to raise money for the city’s street maintenance by using monthly gas and electric franchise fees. That’s right. Suburban Baxter, which is just about to enter that second life cycle of the suburban Ponzi scheme in full force, needs money for street maintenance. It is actually road and stroad maintenance as Baxter does not have one single street in its entire inventory. Nonetheless, a slush fund of franchise fees or other uncorrelated charges – along with debt -- is just the thing desperate local governments turn to when all that new growth is suddenly not so new anymore. Council member Jim Klein questioned the connection between roads and electric usage. “It’s not a perfect correlation,” said Gordon Heitke, city administrator. 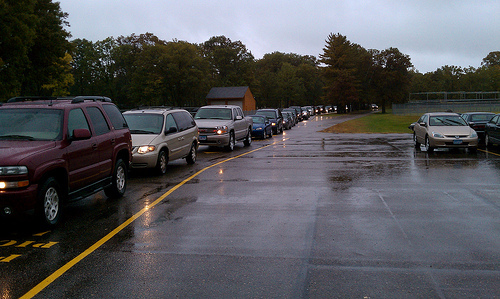 The McKid line at Baxter School. No parents got wet in the taking of this photo.It would be very easy (and old hat) to sit and rip on Baxter. For the typical reader of this blog, they represent everything unredeemable about post World War II development: the highway commercial strip, the endless low density subdivisions, the brand new public facilities justified with an illusion of wealth, the smug sense that the illusion of wealth is somehow a byproduct of their unique genius, an unawareness that the predictable pattern of auto-oriented development (growth, stagnation and then rapid decline) will somehow not apply to them. Too easy. Today I would like to focus on two things: (1) why slush funds are dangerous, but (2) why cities have little choice but to use them anyway. Voters will never accept an increase in the gas tax, tolls, user fees or congestion pricing, but they won’t actively resist a tiny increase in the sales tax. Since the sales tax is also a cash cow (second only to a value added tax), and since the transportation projects we want are SOOOO important, let’s go for it with a sales tax. Why won’t users accept an increase in gas tax? According to the National Society of Professional Engineers, we are too spoiled, too cheap and take infrastructure for granted. The same logic can be applied tolls and other direct user fees. We’re a bunch of anti-tax, spoiled brats. OR, it could simply be that, with the absence of a proper pricing mechanism, users don’t register the actual costs of transportation. That same NSPE article indicated that users believe their gas tax pays for the roads. The reality is that it’s not even close. And even crazier, users expect to drive congestion-free roads during rush hour. Where there is congestion, it needs to be fought with additional capacity. It is near blasphemous to many to suggest that perhaps some people should travel a little before rush hour, others a little after, to make more efficient use of the system, and that there could be some type of financial incentive to make that happen. Photo by WSDOT. Click for original.Nobody in their right mind expects to pay the same for an airline ticket the day before Thanksgiving that they would pay two weeks prior to that. Everyone accepts that the new release DVD is going to be priced higher to rent. We all understand that calling long distance evening and weekends is cheaper than during the middle of the day when there is greater demand. We all understand and WE ALL HAVE NO PROBLEM with this. It makes sense. So why doesn’t it make sense for highways? If we want more transportation spending, why don’t we pay more? Why don’t we have tolls and congestion pricing? If you say because it is “government,” then how do you explain higher charges on subway systems and Amtrak for peak times? Why does the Postal Service charge more for expedited service? No, government has the ability to properly price things when it wants. Why not highways and new transit projects? The answer is not us. It is because the people in government want to build more than we are willing to pay for. The politicians, the staffs, the engineers and public works directors along with all those professional advocates and their associates – many people reading this blog right now -- they all have dreams of this bigger, grander system. And we support it, but only because we are never asked to pay for it. Buy me lobster and I’ll eat it. Make me buy my own meat, and I’ll eat hamburger. Here’s the thing no DOT or public works department wants people to understand: If they charged people the price of the transportation system, usage would drop through the floor. This is why direct fees are NEVER an option. The entire system would financially collapse. Charge a toll and people would drive less, necessitating another toll increase, causing more drop in usage, and on and on and on…. It is a dog chasing its tail until we got to a much, much smaller system. This is not in the interests of anyone in a position to make this decision. This is why a sales tax or this random utility fee is so dangerous. These schemes allow us to increase an already bloated system – one deformed far beyond anything taxpayers are willing to financially support – making the eventual day of reckoning all the more difficult. We’ve shown that we’ll keep building until we can’t scrounge up another dime, never questioning why, despite all of our growth and affluence, and despite the high total rate of taxation, we are perpetually starved of revenue. But I also said that local governments have no choice. They don’t. If you look at the list of taxes and fees that local governments are allowed to charge, it is usually pretty small. Here in Minnesota you have permit fees, these franchise fees, a couple of miscellaneous service charges, property taxes and, if the legislature approves, a short-term sales tax. So no matter where you are in the state, no matter what the local mix of commerce, no matter where you are at in the development cycle, you have the same exact tax structure. An agricultural community has the same tax structure as a tourist community as does a mining community as does one dominated by a single manufacturer. The idea here is that local governments are incompetent, they can’t be trusted not to mess up their tax system, and so the state needs to intervene. The other – often unspoken – reason is that the large corporations that dominate centralized political systems would rather deal with (ie. purchase) one large and dominant political entity than have to deal with hundreds of small ones. This is often called “streamlining” or “efficiency”. You’re welcome, WalMart and McDonalds. Ask yourself this: Why is the federal tax code so complicated it is beyond comprehension yet your local tax system is so simple and blunt that it is practically mindless? Why is the level of government that is least in touch with what is going on in your community, in your neighborhood, on your block writing such intricate and complex tax laws while the level of government that knows your community the best – your local government – has no power to customize their revenue stream to the community? Federal and state tax laws should be simple, predictable and evenly applied. Beneath that framework should be a complex patchwork of local taxes and regulations. A mining community should have extraction fees. A tourist community should have lodging fees and sales taxes. An older community should have a good land tax while a growing community may want a healthier mix of direct user fees. Oh Chuck….what an administrative nightmare! You mean Dunkin Donuts would need to track fifty different local tax codes, fifty different regulatory approaches, one for each community they are going to open a new store in? Won’t that stifle growth? Yes it will. Two kinds. The large, corporate franchise kind and the government kind. I’m good with that. Are you? Last week I did not get a chance to add my thoughts on how local governments can avoid franchise stores like Dunkin Donuts, but that didn't stop the conversation from happening anyway. Head over to the Strong Towns Network and join in that conversation. And in the meantime, if you’re new to Strong Towns and want to get up to speed quickly, get a copy of Thoughts on Building Strong Towns (Volume 1), a good primer on Strong Towns thinking. And check back here tomorrow – we’ll be here with new stuff to get your brain going all week long.